It looks like the guide prices have come back down to more “sane” levels, but the carts and the complete sets continue to go up in price. Part of the reason the average for complete sets is so high this month is due to a brand-new copy of EarthBound that sold, without it, the average price still rose to $458 from $430, though. Man, with each passing month these updates sound more and more like stock reports 😯 I don’t know the first thing about stocks, though, so maybe I oughta check out Wall Street Kid for some learnin’. Anyway, as always, there’s lots of buying tips and info on buyearthbound.com, so check it out if you’re planning to buy any of the above anytime soon – you could save loads of money! Judging from H’s post, It looks like my hunt isnt futile. I’m searching every yard sale for Earthbound. The money isnt going to Itoi or anyone who made the game, anyway. So I’m still waiting to get it. wow, I bought my cart for $70 like 2-3 years back…. Thats pretty cheap now. Good job H. I’m always glad to hear some people are still able to get the games at good prices. @H: Yeah, my thoughts exactly. It’s always good to be optimistic. Has anybody thought of buying both and save plenty of money? 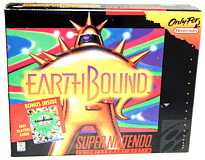 The man who bought earthbound for $90 is making me jelly. It’s getting ridiculous now…I’m so glad I bought this game back in the day. Anyway, I heard that some guy online found a loose cart of Earthbound for $1 at his local Goodwill. I’m not kidding. Man, I bought my copy for $150 and got the guide for $80 3 months ago.